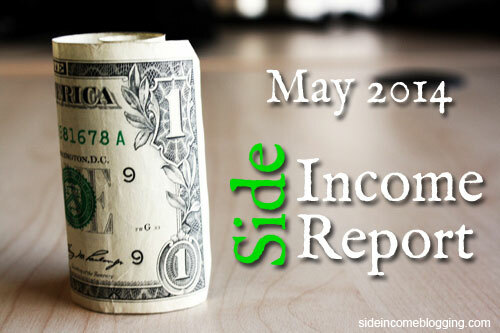 I cannot even begin to tell you how excited I am to share this Side Income Report with you. Not only was May my largest earning month of the year, I came really close to reaching my goal of $1,000.00 per month in passive income! My biggest single income generator for the month? Amazon affiliate income from my Amazon based niche sites and the income continues to trend upward. In fact May is was my largest month so far for Amazon income, but I won’t be able to report that income until July, as Amazon pays two months “in the rears”. I’ve been really focused and busy over the past month. I wrote and released my first eBook, BE a better blogger in May. So far it’s been a big success, and if you haven’t picked up a copy yet, you can get it free by signing up for my newsletter. I’ve received lots of positive feedback from subscribers so far. I’ve also seen my subscriber counts going up, so the incentive is working. Would definitely recommend making your own eBook to giveaway on your site. I built out a new niche site as part of a “Niche Site Duel” I’m in with 12 other niche site experts. If I play my cards right, this site is going to be a big income generator for me down the road. I’m not ready to share it publicly yet, but I will once it begins to rank and get some traction. This will be the third niche site in my current inventory, and I’d love to get five of them going and maybe look at flipping one of them. You can read about it in the two updates I’ve done so far, here and here. I’ve also just been building out content for all of my sites, and in particular my niche sites. Most of that content I’ve written myself, while some of it was written using iWriter, which I discuss in a little more detail in my latest niche site update. I also started exploring teespring campaigns last month. As you’ll see in my income numbers, I found teespring to be a very viable income source. I’m working on an article about this new income stream. Running teespring campaigns is also fun, and requires very little upfront investment. The one I ran in May was my very first one. I made a number of mistakes and still earned over $100.00! I’ve been talking to some people in various teespring forums that are earning well over $1000.00 a month! No kidding. Definitely something I’m going to continue to work on and explore. As you can see, I have my hands in a number of things right now, but I think it’s critical to diversify yourself, your sites, and your income. Enough rambling, here are my income and expense numbers for May! EasyAzon: $37.00 – Well worth the money, it’s easily saved me far more than that in time saved. You’ll note that my expenses we much higher this month than prior months. Now that my income numbers are up, I’m going to start using some of that income to build additional sites and begin outsourcing some of the work that I’ve been doing myself. I also purchased a few tools to help me save time and ran some Facebook ads related to my teespring campaign. These are the first baby steps towards me scaling up my niche site business model using outsourcing. Overall, a really awesome month and VERY close to my current $1000.00/month goal from passive income alone. Once I reach the $1000.00/month goal, I’ll bump that up to $5000.00. A stretch goal, but one that I firmly believe I can do in the next 6 – 12 months. How was your month? Feel free to link your income report in the comments below. Good numbers! Just keep working steady and you will get there. So you spend $10 and made $90 profit with tee spring? If so, those are really good numbers. You shouldn’t have a problem scalating that. Hi Miki – Thank you, and appreciate the encouragement. Yes, $90 profit on the teespring campaign. I was disappointed though on the Facebook ad conversion rate. I’ve seen people be very successful, so probably just a learning opportunity for me. Most of the conversions on the T-Shirt sales came from a large Facebook page I run for my Blue Ridge Mountain Life blog (http://blueridgemountainlife.com). I’m going to try to get that first teespring article out here in the next week or so, and will drive into some details of what I’ve learned so far. All I can say is that you have done a pretty good job on your Teespring campaign. I first got the idea from cloudliving.com and then bought the course recommended by Tung Tran, but I have not seen any success yet after running 7 different campaigns with over $250 spent. The best 2 I have got are only sold 4 out of 20 shirts each. Would you mind sharing some details with me? I really need some help here. Congratulations Larry! That’s awesome, sounds like you’re CRUSHING it! My month of May saw a large decrease in earnings, but it was only due to a few keywords slipping from #1 to #3 – but they were my “buyer” keywords. I’m okay with it though since my entire business is still growing. Keep it up! My main money site lost ranking for one of the keywords that brings me $300+ per month. Ouch!!! – still working to gain the ranking back. Thanks Dave, certainly trying! I had a few keyword ranking issues, but nothing catastrophic from a $ perspective. This blog took a hit initially, but seems to be regaining some traction. Congrats on the big month! I’m just getting started on my side income journey, so hopefully you can bear with me on a few questions. What made you decide to write the e-book? How does it fit in with your overall marketing plan? I also noticed that you seem to be primarily focused with content creation instead of link building. Do you think that a few web 2.0s and forum posts are enough to rank your sites? Hi Andy and thank you. I wrote the eBook as an incentive for people to subscribe to my mailing list. This allows me to build up a list of followers that I can directly interact with. While I do a little selling, I focus on providing value. I don’t think a few “web 2.0s and forum posts”, I know they do. I have a niche site that right now is on page 1 for two of my primary target keywords. No linking building at all. Just Google+ and Facebook shares and quality content. I have earned a few natural links, but no intentional “link building” as most people do it. With that said, doing it that way takes a long time. The site I am referring to was started in July of 2013, so almost a year to get on page 1. Link building will definitely get you there faster, but at a cost. As I’m sure you know, from the various articles on your website, link building is risky, and if not done correctly, can ruin your site. But, if done properly and cautiously, you can quickly rank a site on page 1. Quickly being about 2 months currently. I’m currently working on some case studies around this now, and hope to write about them soon.